Yes, that was an April Fool’s post yesterday. 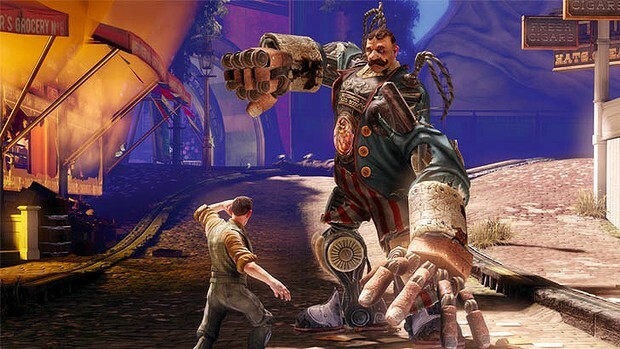 I don’t really hate Bioshock Infinite. In fact I’m about eight hours into the game and it’s really, really good. Not 5/5 good, as it has some padding issues and I found a few bugs on the PS3 version, but it’s a fantastically well-made game that is a blast to play. Especially when fighting these guys. With the foolish stuff out of the way, I’m excited to announce that I”ll be featuring a handful of guest writers this month on Vagrant Rant for the first time ever, just to change things up a bit. A week of guest posts will start mid-month and range from instructive to critical to bitter and beyond! Aside from that April is traditionally a pretty quiet month when it comes to entertainment media, the highlight of which for me is the (way late) release of Fire Emblem: Awakening on 3DS. Speaking of 3DS, I’ll also be posting a 3DS vs PS Vita comparison piece this month as well. Keep it here. Thanks man, you scared the crap out of me yesterday; suddenly I wasn’t looking forwar to playing Bioshock Infinite at all, and there goes $80 down the drain. Go click on Google Nose, I dare you.